Enjoy a day on the water with a professional, no experience needed ! 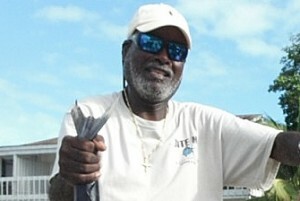 BITE ME Sportfishing Charter's Captain ‘Fineline’ has spent his entire life fishing the sparkling seas of the Turks and Caicos Islands. With his local knowledge, fishing experience and professional skills you are guaranteed a fantastic day of sportfishing in Turks & Caicos Islands ! Every year Fineline participates in the major Turks and Caicos fishing tournaments. His awards include ‘Top Angler’ in Caicos Classic Billfish Tournament and ‘Biggest Fish’ in the Heineken Grand Turk Game Fish Tournament. The excitement and struggle of a deep diving Tuna, or a Wahoo or Dorado zig-zagging across the wake, will energize you for the task of reeling in the fish. 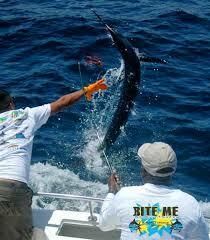 Imagine the frenzy of a Blue Marlin walking on the end of your line ! No previous deep sea experience is necessary for you and your family and friends. Captain Fineline and his first-mate will ensure that everyone aboard is very comfortable. BITE ME has a new sport fishing boat, 'Record Breaker', for the 2015 fishing season. She is a 36-­foot Lewis, with twin engines and a comfortable cabin and accommodates up to 10 people. Our equipment and rigging match all expectations. The Penn reels allow full control. Stop by Turtle Cove Marina to admire our new boat and visit with us ! 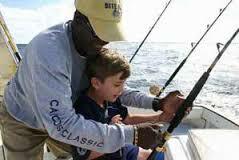 Sport Fishing with BITE ME can be booked as half-day or full-day outings. Half‐day outings include use of fishing equipment, bait and complimentary beverages (sodas, beer and water). Full-day outings include all items in half-day plus complimentary lunch. BITE ME Sport Fishing invites you for a day on the ocean. Call or email to discuss how to book your Ultimate Sport Fishing Excursion in the Turks and Caicos Islands. We will make it happen for you !! Turtle Cove Marina, Providenciales, Turks & Caicos Islands, B.W.I. Copyright © 2019 BITE ME Sport Fishing Turks & Caicos. All Rights Reserved. Bite Me Sport Fishing P.O. Box 725 Providenciales, Turks & Caicos Islands, B.W.I.